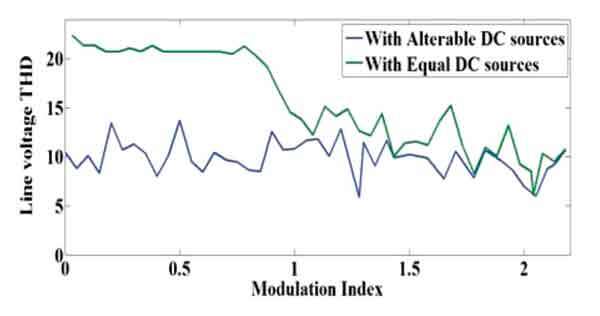 In this paper, a switching scheme based on minimization of total harmonic distortion (MTHD) of line voltage is studied. MTHD is suitable for some cases e.g. multilevel electrical drives and flexible AC transmission systems devices such as multilevel static var compensator, multilevel unified power quality conditioner and multilevel unified power flow controller, where DC link voltages are altering. By using MTHD the DC link values are set to the predefined values in order to optimize THD. In this paper the recently developed evolutionary optimization method named imperialist competitive algorithm (ICA) is used to solve MTHD problem. MTHD minimization is directly applied to line-to-line voltage waveform and the results compared with the case of a multilevel inverter with constant DC sources. The comparison of results validates the efficiency of MTHD in decreasing the THD value. Also, the obtained results compared with the results given in the recently published paper using GA, confirmed that ICA is more effective in this regard. Simulation and Experimental results are based on a seven-level multilevel inverter to verify the obtained results. Imperialist competition algorithm, line-to-line voltage, THD minimization. Electrical Engineering Department, Faculty of Engineering, Azarbaijan Shahid Madani University, Tabriz, Iran.